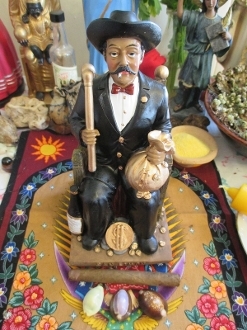 San Simón, also known as Maximón (pronounced Masheemon), is a folk saint venerated by the Mayan people of Western Guatemala as well as those who practice hoodoo and Spiritism. San Simon is referred to as the “Champion of the Hopeless” because of his willingness to work with just about anyone for just about any request. He is well known for providing folks with the necessities in life; money, health, employment, housing, etc. He is also called upon by those who gamble or play games, for favorable outcomes. He is also known to protect and defend households and his statues are often placed at front doors where he can protect the home with his baton. He has been known to protect from physical intrusion as well as bad luck and illness. Offer him fresh corn tortillas with hot sauce, a glass of fresh water, cigarettes, beans, flowers, copal resin, coins, feathers. Burn copal, or another fine incense, at noon each day for as long as you need his help, or help for a loved one. Place a paper with your request under the candle, tap the glass of water 3 times then recite this prayer; "Oh powerful San Simón, help me with all of my actions and with any dangers that may arise that I may need assistance. If I need help in matters of love, you will draw the one I love closer to me, if it be business, that I will be successful, if it be enemies, that you will help me to overcome them, and to keep hidden troubles away from me. I offer you your cigar, your tortilla, your liquor, and your candles if in return you will keep me safe from any danger I may come across. (State your petition)." This prayer was taken from commonly sold San Simon 7-day candles. thanks for looking! ashe! You will receive ONE statue, colors vary.